In an increasingly demanding digital world, customer expectations have never been higher. Ecolane's mobile app, built from the ground up, meets and exceeds those expectations and is a mature and functional addition to our product offering. Freely downloadable today and available on both iOS and Android platforms, see how Ecolane’s mobile app can simplify an agency's operations and improve the lives of the riders for whom they're responsible. In today's world, providing riders with direct access to review and manage their transportation needs is essential. Users of Ecolane's mobile app can view both upcoming and completed trips, while also having the ability to cancel travel if they no longer wish to ride. Built-in phone notifications alert riders with vehicle ETAs, reducing wait time and providing a significantly more positive experience. 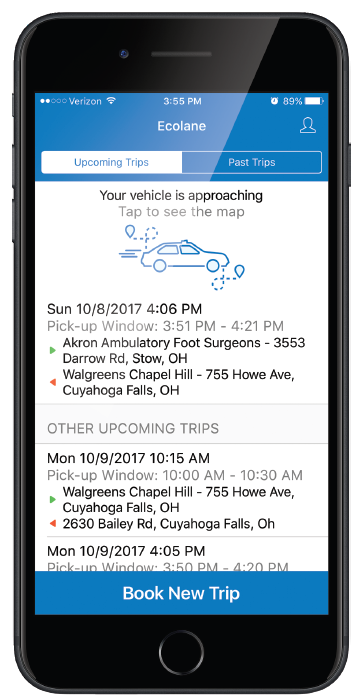 When a vehicle is on its way, riders are able to track the journey using a visual map. Trip planning has never been an easier experience for riders than with Ecolane's mobile app. 24/7 access to account profiles, reservations and travel history with a single tap, all connected to the most powerful, industry-leading scheduling and dispatch platform available. Text to SpeechRobocalls were great, five years ago. Utilizing the text-to-speech capabilities native to today's smart phones is cheaper, easier and provides an all-around better experience for your riders. By providing riders with the opportunity to book their trips directly through the app at any time of day, even outside of business hours, the volume of incoming calls is significantly reduced. The mobile app is fully integrated with Ecolane’s DRT platform and provides all the power of real-time scheduling and continuous optimization inside the convenience of a mobile phone. No manual scheduling is required by dispatch. Automatic push notifications remind riders of scheduled/upcoming trips, significantly reducing no-shows and same-day cancellations. View our mobile app terms of service. Why Should You Schedule a Free Mobile App Demo with Ecolane? The number of riders expecting the freedom to review and manage their personal transportation options increases every day. Agencies need to respond to these expectations while also streamlining their scheduling operations. Ecolane's mobile app does both. 3.6 million Americans miss medical appointments each year because they need a ride. This leads to higher health care costs and poor illness management, even when care is readily available. Ecolane can help. Ecolane’s mobile app is designed to help agencies empower their passengers, while reducing the workload of their call center. Giving passengers the ability to manage their transportation from the palm of their hand increases rider satisfaction, and deepens their connection to their service. We’re happy to be a partner with each of our customers in the mission to upgrade transit for their riders.